For the first entry of this series it would probably make the most sense to tell a tour story involving a sold out show, a huge crowd with a wild party. Then you, the impressionable reader, would perceive me as a rising star, the next big thing! However, I am not going to do that. In fact I am going to do the opposite of that by telling you a story of a recent show where hardly anyone showed up. A show that, with the wrong mindset, would very well have seemed like a waste of time. But low and behold, there is no such thing as a waste of time on tour, only missed opportunities that the observant eye is keen enough to catch. It was the tail end of a string of solo shows and I was pretty beat up from the road. Albany was the last stop and then it was off to help my lady of five years pack up her belongings because come Monday we were parting ways and she was starting anew out on the West Coast. But that’s an entirely different story for a different time. As I parked out front of the venue on the street, I saw a group of youngsters unloading drums from a softshell cargo carrier strapped to the top of their Subaru station wagon. They were the other band on the night’s bill and it didn’t take me long to realize this was their first tour. In no time I made friends with the young band. There was something about their vigor and enthusiasm that filled me with happiness. Maybe because it reminded me of those very first tours that I embarked on so long ago. The windows down, the cool breeze hitting your face as you leave the limits of your city, off into the unknown of the wide open country. Few feelings match those first tours with your brother in arms, your trusty bandmates. I played last that night. When I got up to play, there were probably seven people in the entire venue including a few regulars at the bar, the sound guy, bartender and the other band on the bill. After playing the first song, I felt compelled to tell a story to those in attendance, specifically to the young band from Pittsburgh. 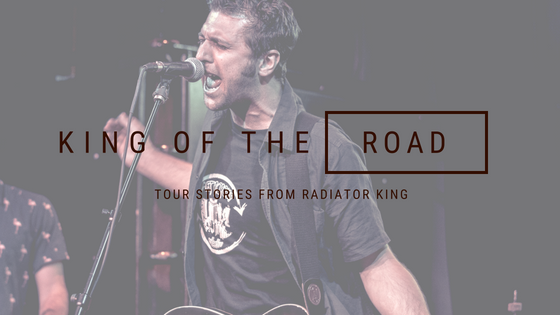 The story was of my first time out on the road when I was probably 17 or 18 years old. I don’t remember where it was that we played, but we drove many hours to get to the venue only to play to four or so people who couldn’t have cared less about our music. Discouraged and frustrated I cut our set short, telling the audience a few songs in that this would be out last song. After the show, the bass player, who was bit older and more experienced than I, got in my face and said, “I don’t care if it’s one person out there or 1,000, you play just as hard every night. If you ever pull a stunt like that again, I’m out.” I then promised everyone in attendance I would give them my all despite the turn out. I didn’t tell the story to seem like some hardened veteran or road warrior. I told the story because I felt the young band from Pittsburgh needed to hear it. I understood how they were probably feeling and what they had sacrificed to make the tour happen – using up all their vacation time from work, borrowing a buddy’s car, pouring in money that they didn’t have (and would never recoup) to make the tour happen. And to drive all that way, only to play in front of a handful of people can be a crushing experience, if you let it. It’s moments like that where you start to doubt the dreamer in you and think that maybe your boss, teacher or parent is right – maybe this is all just a waste of energy and the time has come to grow up. But whatever flame inside responsible for casting them off into the absurdity of touring, I felt it my duty to make sure it didn’t die. It’s that fragile flame that is the best of everything that we are, even though the world tries to stomp it into utter submission. The truth is we all have dues to pay and clearly 10 years later I’m still paying mine. At the end of the night I went to settle up with the bartender but like I had assumed there was no money to be made from the door. With the van all packed I drove to the nearest Walmart parking lot (fact: It’s Walmart policy to allow drivers to park in their lots overnight), went inside to wash up and crawled into my bunk in the back of my trusty E350 Econoline Van – a model van that has been getting touring bands all across the U.S for decades. As I lay in the back, watching the midnight shoppers pass by, I began thinking of all the places my music has brought me and all the strange encounters it’s led me to. Oddly enough, it’s been the dingy bars, broken people and uncertain nights that have given me the greatest joy and inspiration on this journey. Then I started thinking about the future, about how I wasn’t getting any younger and I must admit it felt pretty alone laying there in the night. My longest relationship to date was ending, I had hardly any money saved and had no idea where the future would take me nor if I had the strength to go there. I thought about others my age starting families, saving for retirement, paying the mortgage on their house and then me, laying there in the back of my van with nothing but a battered old dream. Self-doubt began to roll in, like it always does when things aren’t going your way. With a head full of poisoning ideas, I tossed and turned, writhing for some relief only to press up against my old ripped guitar case that’s housed the guitar I’ve had since I was a boy. A guitar on which I wrote my very first song and I thought back to how magical that experience felt. To create something out of mid-air for the first time is quite profound. I then thought of something an older and wiser musician had once told me, “If it was easy, everyone would do it.” Huddled up against my guitar, I smiled at the night and got the best sleep I had in weeks.